Some of the cyclists from the Skegvegas 100 road race team - raising funds for Skegness' Derbyshire Children's Holiday Centre stop off for refreshments at the Marine Boathouse after completing a 100-mile charity cycle ride from Derby to Skegness. Seventy cyclists rode into Skegness recently as part of a 100-mile fundraising mission. Riders were raising funds for Skegness’ Derbyshire Children’s Holiday Centre (DCHC). 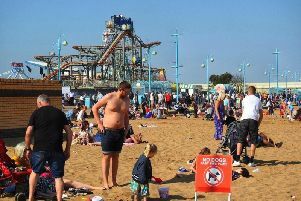 The centre allows under-privileged children in Derbyshire the chance to enjoy a holiday in Skegness - raising self-esteem, attitudes, behaviour and improving social and personal development. The annual race, entitled the Skeg Vegas 100, in its third year, see’s riders set off from Derby City Centre and arriving on Skegness seafront. In the first two years, the race has raised more than £29,000, this year it is thought funds could exceed £40,000. Riders left Derby at 7.45am on Saturday, April 18, first stopping by the Trent River in Nottingham, 21 miles in. Cyclists then made their way through Bingham, Bottesford and into Lincolnshire at Grantham and after snaking through Sleaford’s streets, riders stopped in Billinghay at the 69-mile mark, making a final stop in West Keale before filing in for the last 15 miles to the coast. First back, Mark Inman, arrived at 1.10pm, the final finisher, Terry Eley – who lost two stone in preparation – arrived just before 6pm. He was later presented with the Yellow Jersey for his efforts. This year saw the rides first tandem, the quickest finisher (despite a terrible headwind) and youngest rider, Robbie Boam, 10. The centre has close connections with many of the riders and is also close to the heart of ride organiser Aaron Willis. gas, text SKEG47 followed by either £10, £5, £4, £3, £2 or £1 to 70070 and visit the ‘Skegvegas 100’ Facebook page for more information.